Over the years I've changed a few tiny things here and there, but not a lot. We still love this kitchen, but it's time to make some more substantial changes. Now, some things won't change. We can't change the cabinetry, and we can't change the countertops. That's okay: the cupboards are custom-made solid maple and the countertops are thick granite. But I want more of a farmhouse look in my kitchen, so I'm making some changes. And now for the change I'm most excited about--another paint change. As I said, our cupboards are custom-made solid maple, and my family decided that painting all these cabinets is not the way to go. But that doesn't mean we can't paint any of them, does it? Look! I realized that when I looked at my kitchen all I saw was a sea of brown. No more! The island color is another Sherwin Williams color, Oakmoss. I think I'm in love. I left the hardware on the perimeter cabinetry alone, but I changed the hardware on the island. The new knobs and pulls are "Gilmore" from Restoration Hardware. They're very heavy and so old-fashioned looking, don't you think? I have several more things to do in this room and hope to have my updated kitchen finished before Easter. I keep telling myself "slow and steady wins the race." What do you think? Do you like the green island? Have you ever painted kitchen cabinets? 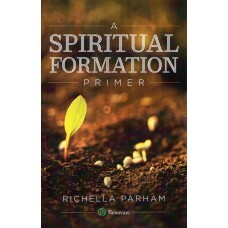 Wow - it looks great, Richella! What a difference it makes to your kitchen. I've been working to add some farmhouse touches to my kitchen too and am loving getting rid of some of the brown. Nothing drastic for us since I hope that we'll be downsizing in a year or two - just cosmetic changes. Look forward to seeing more! I love that island color, Richella and the lighter walls. Can't wait for more. Hi Richella! I love love love your beautiful kitchen and I really like your island painted green. Green is becoming one of my favorite colors as it looks great with everything. I love all of the space you have - your kitchen is just a dream. Hope you're doing well. A little paint does go a long way to changing things around! l love the green on the island and he new wall color. Looking very fresh. LOVE your green island...I have a white kitchen and two years ago we painted our island black...so happy with that decision! You have such a pretty kitchen looking forward to seeing the other changes you make! What about painting your range hood to match the island...just a suggestion. It looks wonderful already! Love the island color and Liveable Green looks perfect. Oh wow! 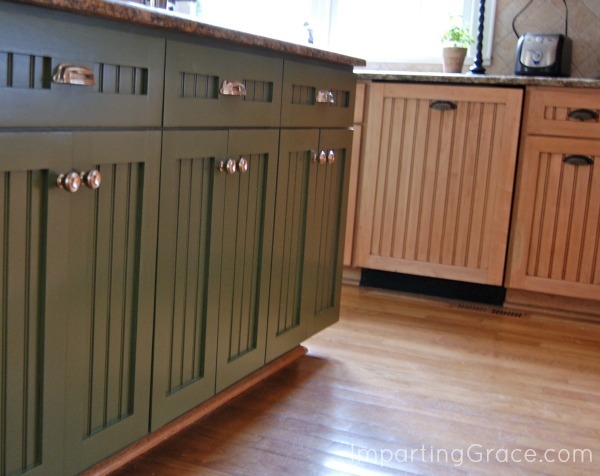 That green island cabinetry really pops and makes a wonderful focal point...such a pretty color of green! I can't wait to see what you do next. I had dark walnut cabinets in our other house (not very good quality) and painted them a creamy white. It was the best thing that was ever done to that kitchen! I am anticipating painting my current cabinets white in the near future also! The green looks perfect in your kitchen. My eye was immediately drawn to the island when I scrolled down to the picture that showed its new paint. Your kitchen was a dream to begin with....all that storage and tons of work space!!! The green wall color really freshens up the space and the island.......wow, what a change!!! Love that green, perfect to break up all the brown......how about a patterned rug in front of the sink??? Can't wait to see what else you do!! The new facelift is AMAZING!! I may have to copy this down the line, I love it that much! The island blended in with the kitchen before, NOW it's a gorgeous focal point. I LOVE it, wow what an impact. This has added so much warmth. Great job and can't wait to see more. Yes, yes, yes to the green island! Not only do I love it, I'm going to steal it. (the color idea, that is.) That color is stunning; just what I was looking for. I love what you have done. The kitchen needed that pop of color. And green is my favorite. I may steal your color as well............ Thanks for letting us in on the gorgeous green !!! I love the island!! Just perfect!!!!! Green is my favorite color, so yes I love. I love the green island Richella. Beautiful job. I can't wait to see what else you do with your kitchen. I've recently painted all my cabinets (in a much smaller kitchen) and the island. The big reveal will be coming soon on my blog. I absolutely love it. LOVE it. I'm very partial to green anyway but in your kitchen it is the perfect choice. I like your new wall color too. It really gives you a new look. I like that hardware too. Oh, wow, I love that color on the walls; and the island is beautiful! I think it is so smart to give an island a certain uniqueness and paint is the best way to go. Really like the new hardware, too. BTY -- Gilmore is my maiden name! Love it!! The new paint and island looks awesome. Absolutely gorgeous! I especially love how the island changed. Very nice job! Your new paint looks awesome! That island is just enough to give a big impact and I love your color choices. 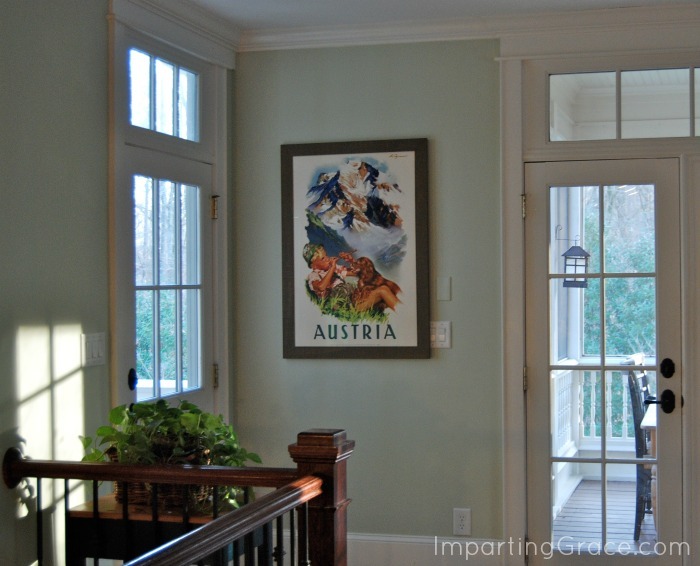 My dining room is actually painted Liveable Green SW. Love! 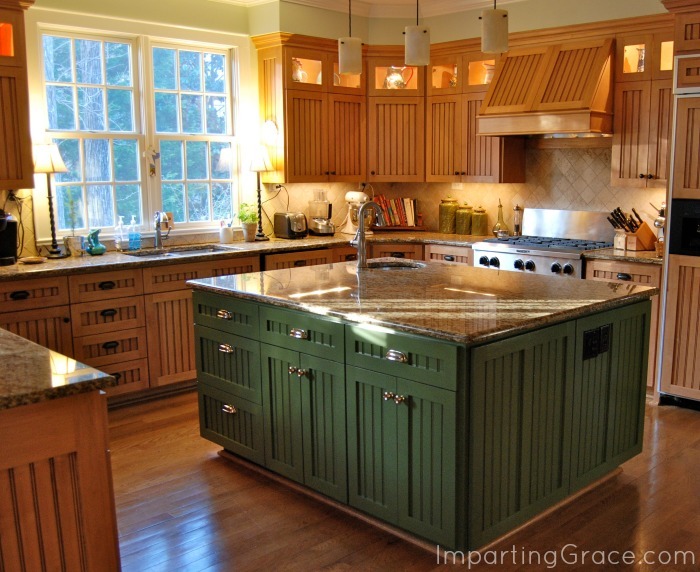 I loved your kitchen before and now I love it even more with the island painted green. It is stunning! Beautiful kitchen! Seems like the granite was there when you moved in, but do you happen to know what kind/pattern it is? I'm looking into getting new countertops right now, and I really love yours! Hi Liz! We bought this house as it was being built, and the granite was already installed. But I've found granite that's a pretty close match to this under the name "Santa Rita." (I think perhaps I saw it at Home Depot by that name.) We've lived here for 10 years now, and the granite is still in mint condition. It's so easy to take care of! Good luck in choosing your new countertops!